We’ve already run down the events you should strongly consider attending during Chicago Craft Beer Week, but after poring through the list of events, tap takeovers, brewery features, beer dinners and style showcases, we’ve noticed a few themes emerge this year, and a few things that you won’t be seeing. If you want to really strip the enamel from your teeth on a parade of Flanders reds, lambics, goses, Berliner weisses and oud bruins, you’ve got lots of options. 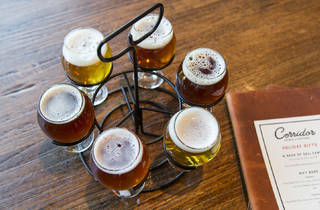 No less than five events take place over this week dedicated to the showcase of sour beers. Delilah’s features a whole bunch of crazy imports, Fountainhead is showing off the highly praised sours from DESTIHL, Monk’s Pub features all of Goose Island’s Sour Sisters, Jerry’s Sandwiches has a Jolly Pumpkin sour feature set up and The Green Lady... well, we don’t know exactly what will be on tap, but we do know that owner Melani Domingues loves her sours and knows how to find the good ones. There are a handful of events showing off beers from the big guys—breweries like Stone, New Belgium, Bells—but this is Chicago Craft Beer Week. The city and suburbs are right to be pretty provincial for this ten day stretch of beer insanity, so feel free to dabble in the beers from Michigan, Colorado and California for the rest of the year, but double down on the local stuff during CCBW. Do craft beer event organizers know something about the weather during CCBW that we don’t? Because we usually consider a Lake Michigan Cruise to be one of those things that’s best when it’s warm and calm, and May can be a crap shoot for that kind of thing. Either way, you don’t need to limit yourself to solid ground for your beer events this year. Mystic Blue hosts a West Suburban Brews cruise on May 22, while Shoreline Sightseeing sets sail for a Revolution Brewing cruise on May 27. And if real boats aren’t your thing, Weathermark Tavern hosts a toy boat race on the 20th hosted by Great Lakes Brewing Company. Poor Small Town Brewery. Sure, it’s probably making money hand over fist, selling Not Your Father’s Root Beer to the saccharine-happy masses across the nation. They’re still trying to convince people that it’s beer, though, and to that note, there’s just one lonely little tasting of their NYFRB and Ginger Ale during CCBW. If you really want to attend a Small Town Brewery event, it’s scheduled at Wicker Park’s Boundary on a night when there’s more events than any other night of the week, Friday the 20th. At least Henry’s Hard Soda and A-B’s Best Damn line of sodas had enough sense not to even try to cut in on craft beer’s ten-day party. You think that the alcohol intake over CCBW is extreme? We’ve got sausage pairings at Mad Mouse and Werk Force, whole hog dinners at All Rise and IBW’s Roast and Prost, donut hole beer pairings at Smylie Bros., Burnt City’s Bavarian Brunch with bratwurst benedicts, a bunch of smoked meat products at both Public House and Smylie (again), Hoosier Mama pies paired with Sketchbook beers and plenty of food trucks on hand at the Baderbrau opening fest. Savor your quinoa salad and kale smoothies on your own time. There’s gluttony to get to. During CCBW, Corridor Brewery & Provisions offers bicyclists who show their helmet a special $4 “helmet beer”, and they’re also kicking off their Pedal Up Program as part of the Lakeview Chamber Bike Friendly Business initiative. Bikers get a 15% discount off food with the purchase of a pint of beer. Bicyclists who make the trek to Evanston for a visit to Sketchbook will get to take $1 off of any pour with their helmet as well. Yeah, there’s some Belgian-style beer events around town. 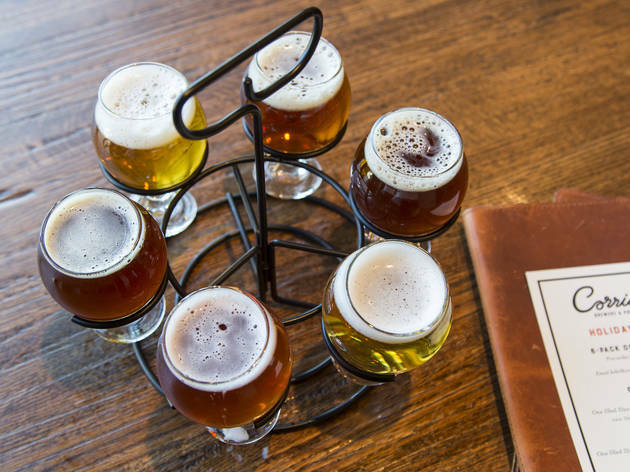 But if you’re hoping to do a deep dive on German specialties, real English ales, or any of the many budding craft brew scenes from around the world, you’re pretty much out of luck. With the great things that people are doing in places like Japan or Italy, you’d think someone would have found a friendly importer by now. Maybe next year. If Chicago Craft Beer Week is a good time for beer fans to get together and celebrate, the runup to the event proper is just as good of a reason for brewers to get together and make some cool beers. The DryHop and Corridor teams went huge on collabs—between the two brewpubs, they’ve collaborated on beers with Broken Nose Cider, 5 Rabbit, Penrose, Tribes, the Commons and Burnt Hickory Brewery (a Georgia brewery that I didn’t even know existed). They also made a beer with Big Star, who so far is batting a thousand in collaborations since their Revolution Fist City is so damn good. Pink is the New Black, a collaboration with the Pink Boots Society and Brickstone will be tapped at Riverview Tavern while Fountainhead and Bar on Buena tap their collaboration with Three Sheeps called Derby Cartwheel, a brett-fermented IPA. Also, at the South of 80 event at The Green Lady (full disclosure: organized by my site, GuysDrinkingBeer), 4 Hands will tap collaboration beers with Destihl (a tart wheat kiwi beer) and Marz Community Brewing (a boysenberry brett IPA). Karl Klockars of Guys Drinking Beer covers all things beer for Time Out Chicago. Not your fathers root beer not beer?! It has water, hops, malted barley and yeast among other spices. Back to beer 101 for this writer.